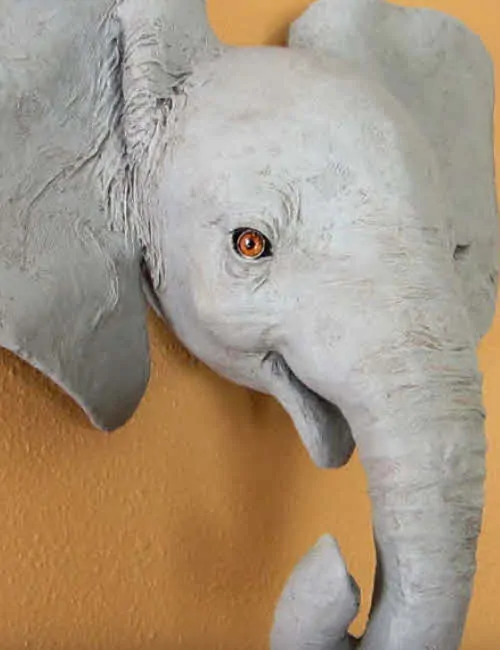 As soon as I’m done my current wall sculpture using a mix of paper, clay, cardboard etc, which has taken far longer & has grown in size quite a bit since I first began it, I can’t wait to try this elephant project. I’ve got great plans for embellishments I’d like to add to her. It’ll very likely be much later in the year, but I’ll definitely share photos when I’m done as I’d love your feedback, being far more advanced than myself in using this medium. Very excited to get started on this later this year. Well worth the $12 it’s going to cost me. Your patterns are super affordable & the accompanying videos help so incredibly much. They’ve also given me a great deal more confidence in starting to do a larger project such as this in a medium I haven’t worked with in this manner. Thanks very much for all the research, creativity, effort & time you put into your art, videos, website, patterns etc. You yourself are an invaluable resource to all of us ? What a great idea! I hope you’ll come back and show it to us, either when it’s at the hairshow or after you hang it in your salon. We’d love to see it. Hi Ralph. I’m glad you enjoy the projects on the site. I do charge for some of the patterns, because keeping this site online costs a lot of money. However, be sure to take a look in the Art Library – there are over 400 articles on this site, filled with fun projects, and almost every one of them are free. I’m sure you’ll find something in the library that you would enjoy making. Hi, I don’t have a printer that works with cardstock paper. If i printed it on regular office paper, do you think it would still work? Or I could also trace or tape the pattern to cardstock paper. Hi Meghan. It won’t work with regular paper, and tracing it would be really difficult. However, you could print the pattern onto full-page labels and then stick the labels onto your cardstock. 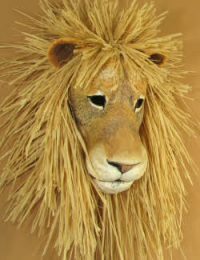 That’s what I’m doing now with the lion mask I’m working on, and it works really well. I found labels that take up the entire sheet of paper, so you don’t have to worry about having part of the pattern cut off. They didn’t have any at my local Walmart so I had to order them from Amazon.com. Hi I wanted to know if there was a way to put tusks on the elephant? Also , would it be possible to put them on without changing the template? Hi Baza. I didn’t add the tusks because she’s so young that the tusks wouldn’t be showing yet. If you want to make her older, it should be possible to add the tusks. Look closely at several photos of African elephants and note the way the shape of the tusks can be seen under the skin. 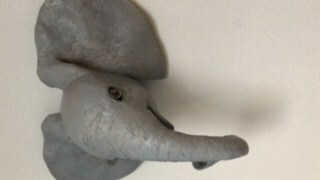 Then look at your elephant pattern after it’s been taped together, and not the bulge on her trunk just above her mouth. That’s where the trunk would go. I would sculpt the tusks out of aluminum foil, to keep them light. And You’d probably want to make them long enough so the top part that’s under the skin can be pushed in through the hole and firmly attached to the inside of the pattern. Once that’s done you can continue with the project, and it should turn out really nice. In fact, I hope you’ll show us your tusked elephant when it’s done! helleo Jonny, I want to order the elephant mask, but I am directly sent to Paypal, on an email account that I can’t reach after. Can you send it to a different email address ? Hello, Mimi. I have no control at all over PayPal. When I click the button I’m asked to sign in to PayPal, and I need to type in my real email address. If you’re already signed in under the wrong address, you’ll need to sign out again. If you signed up a long time ago and you no longer have access to that email, you’ll need to go into your account and change it. Sorry I can’t do any of that for you. Hi Jonni, love your work. was just wondering whether it was possible to get templates that are slightly smaller in size? Id love to make a miniature version of this elephant. loosely the size of hand. Thanks! Hi Amanda. You can make the elephant any size you want. The pieces will be a little more tricky to cut out and tape together, but if you’re patient it will work. Most printers will let you set the size by a percent of the original. If your printer won’t do that, you can take it to a local print shop and ask them to do it for you. Will you be using your elephant for a puppet? Made for a friend’s baby’s room! Thanks for the pattern! Heather, are you trying to upload a photo of your elephant? I really want to see it, but the system didn’t take it. Your image is probably too big. You can use the free online tool here to make it smaller. I hope you’ll try again – what a great present for a new parent. Really cool – Jonni – and how do you get him to hang nicely on the wall? I’m not actually sure – all transactions take place through PayPal. I just went to Google to ask if PayPal would accept INR, and several articles said no, but others say you can use an Indian debit card with PayPal if it’s from certain banks. I have to be honest and say I really don’t know the answer to your question, because I am not familiar with PayPal’s policy in this regard. I’m sorry I’m not being very helpful. How i get paper stick pattern. I’m not quite sure what you mean. If you click on the PayPal button near the top of the post, you can pay for the pattern. It will be available for download as soon as your purchase is complete, and you’ll also receive an email with download instructions. Is this what you were asking? Hi Donna. Paypal will accept a credit card. You don’t need an account to use the payment system. 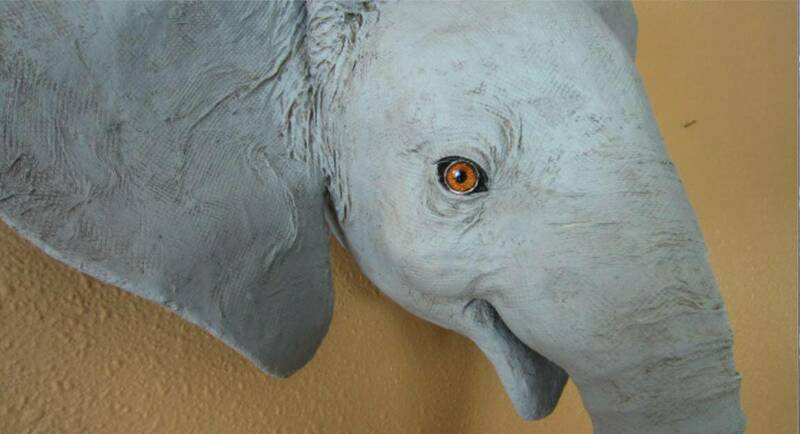 Hi Jonni, just wanted to say thank you for the detailed instructions and video for this elephant. I made it for Christmas for my 3 year old daughter Olive and she loves it. Thanks again! Very nice, Matt! It turned out great. Thanks for showing it to us. I just had a quick question and i may have missed it if someone had already asked it but would this be big enough to fit over someone’s head? 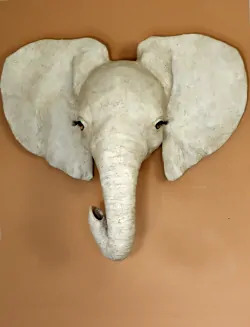 I plan on making a elephant head to wear kind of as a mask for some photos i’m thinking about taking. Beautiful elephant. I have questions about this method. I’m used to use 3d patterns and usually uses car putty for my finishing touch but what I found interesting is that your paper mache cay is really really sturdy almost as much as the fiberglass resin overall. But does the paper mache clay really stick to the Peel N Stick sheets? I could use this for a method to harden my 3d patterns without them to wrap. I have plenty of Peel N Stick from dollar store here. One plus is that when it’s completely dry, the clay is not that really heavy if layered smoothly inside the structure by hands. Interesting questions. 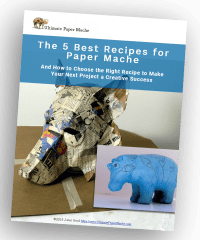 The paper mache clay can be peeled off of plastic, so no – it doesn’t really bond to it. It bonds to paper, so you could leave the plastic off the side of the pattern that the clay will be applied to. However, since all the items I make are rounded, and the pm clay goes on the outside, the paper mache clay doesn’t need the paper underneath for support so this has never been an issue for me. The pattern stays inside, where it belongs, and the wall sculptures are very hard and strong. It might be possible to pry the paper away from the dried pm clay, but I’ve never had any cause to try doing that. If you put the pm clay on the inside, what do you put on the outside? Some plastic clay is meant to be used outside. One friend of mine that were working in an art shop like Omer Deserre suggested it to me because when dryed, it’s almost plastic and the cost is not that high overall, cam be sanded and painted very well and is lightweight. Il already use you paper mache clay to harden a part that is meant to be wearable. This is why I know it’s really strong because it can stand car Bondo filler sandin onto it. But winter is coming here and I can’t work anymore outside so I’m searching for alternatives. Wow… I’m typing too fast. Sorry for the mistakes. Hi François. When you mention the plastic clay, is there a brand name that you’ve used? Do you think it’s essentially the same as the epoxy clay I used on the squirrel and lizard dude? I am writing from switzerland. I never made a paper mache object. 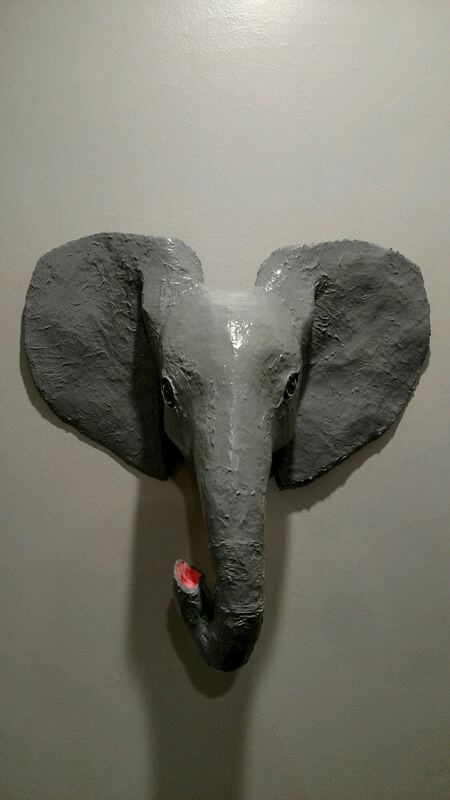 Is it possible to make this elephant? 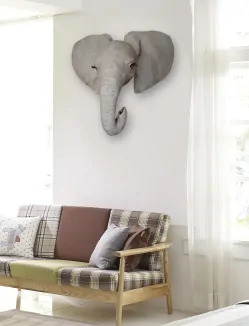 The pattern is the head or it’s the elephant with the body, it is how big and how much are the shipping costs for the Swiss. 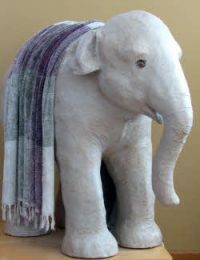 There’s another elephant pattern, for a whole baby Indian elephant, with video. You can find it here. 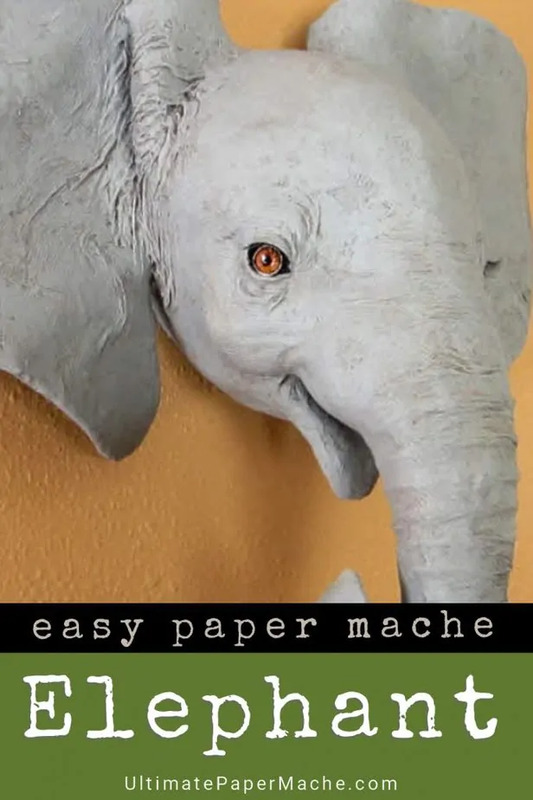 I love your work with papier machè and would like to make a baby elephant for my school sustainability project. 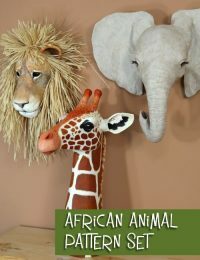 I’m wondering if you think it would be possible for me to use the African elephant head with the Indian elephant body? Would it work if I combined the two template designs to make a baby African elephant? Thank you for the excellent tutorials; I’m really looking forward to getting started! Hi Chimene. I didn’t size the elephant head pattern specifically to match the pattern of the baby Indian elephant, but the body pattern could be made smaller or larger, just by changing the size of the grid you use to draw it on your pattern material. The shape of a baby Indian elephant’s body is slightly different than the shape of an African elephant’s body, but you could easily change the pattern by looking at photos, if you wanted to. The differences are slight. The patterns for the two different projects are very different. The head pattern creates a hollow shape with all the basic rounded forms already created, once the pattern has been taped together. The baby elephant’s body pattern is flat, and simply shows the outline of the body and leg shapes. 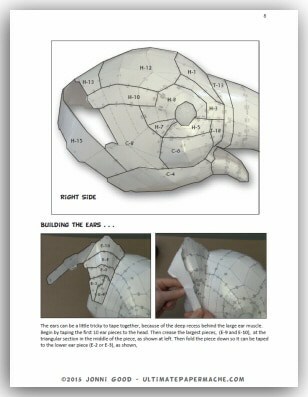 You add crumpled paper to fill out the rounded shapes. It would be interesting to see how the two types of patterns work together. If you try this, I do hope you’ll let us see how it turns out. Thank you so much for your quick reply, Jonni! I will try that and make the adjustments with the body size once I have made the head. I will definitely keep you posted with my progress; the sustainability project is due at the end of my school term in three weeks time so I will be very busy. My teacher is just as excited about this project as I am. You’re welcome. I can’t wait to see how it turns out. 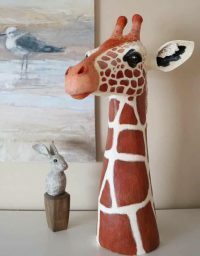 I’ve never done paper mache before, but I’d really like to try doing this. I LOVE elephants! I just need to make sure I can get the supplies first. I don’t know what stock cards are. What size do they have to be? Can you use them in a printer that only has black ink? I apologize if these questions seem stupid I tried looking it up but there was a bunch of options on sizes to get. Hi Stefanie. The paper I used is standard letter size, 8 1/2 inches by 11 inches. It is the heavy card stock that is sold in the office supply section of Walmart. It comes in a ream and is right next to the copy paper. Black ink is just fine.